Credit: By Das Fotoimaginarium on Flickr. Some rights reserved. Two BBC journalists are part of a team which has launched a video app for iPhone which allows journalists to share films of up to 75 seconds in length. Vizibee is a "video network for journalists", David Tomchak, co-founder and chief executive of Vizibee and a BBC journalist told Journalism.co.uk. 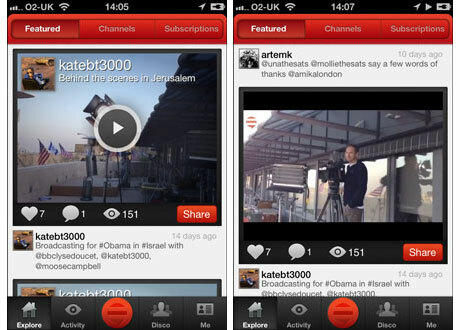 Vizibee joins a number of other video apps, such as Tout, SocialCam, Viddy and Twitter's app Vine, but this app only accepts videos from journalists to ensure a certain quality. The app was released into the App Store in December and is already being tested and used by some big name journalists, including BBC correspondents Lyse Doucet and Jon Sopel. Journalists are using the video app both for sharing breaking news and for providing behind the scenes insights showing audiences how news is made. For example this film shows Jon Sopel breaking the news of the new pope and here Lyse Doucet in Jerusalem allows audiences to meet the cameraman, producer and engineer, and explains why they are shooting from a particular location. 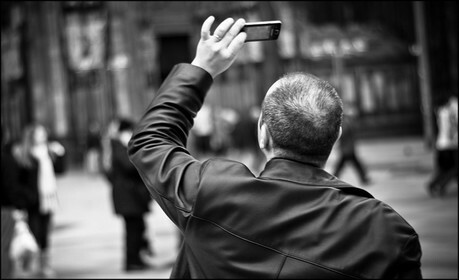 Videos can be shot within the app, which offers basic 'topping and tailing' editing. Films can also be imported so anyone wanting to create a package with transitions, filters and more complicated edits can shoot and edit in another app and then import to Vizibee. Videos can be shared via social media and viewers can also use the app or the website to view and engage with stories. Journalism.co.uk spoke to David Tomchak and to Samantha Barry, a producer, journalist and trainer at the BBC and chief community officer at Vizibee, to find out more. What is the idea of Vizibee? Tomchak first came up with the idea for a video-sharing app about nine months ago. "It was pretty self-evident that there was an issue with the quality of video being shared," he said. He said many videos being recorded and shared via other apps are of parties, and "when you search for something you might find someone blowing out birthday candles." The Vizibee team therefore came up with the idea of building a "video network for journalists". Why can only journalists upload videos? Tomchak said the idea is to ensure the platform offers only high-quality videos that can be trusted. He believes by only allowing journalists to post, videos will contain accurate information, especially when created at speed. Journalists can apply to become a content provider on Vizibee. Many will need to wait for approval but certain news outlets are recognised by Vizibee and journalists applying with a branded email address will be approved instantly. And after journalists share footage, the audience then engages. "Journalists start the conversation but everyone who is watching can comment," Barry explained. How does the journalist and news outlet benefit? By creating videos the journalist can enhance his or her personal brand, sharing the footage with their social media following, and the news outlet they work for also benefits. Tomchak explained that there is a "dual path" when a video is created. When you hit upload within the app the video can be shared from the journalist's own social media accounts and can also be sent to the news outlet. The outlet can then approve the video to share it on the brand's Facebook page. Broadcasters and other outlets can also use the app to "monitor journalists more efficiently", seeing what individuals are posting to social media, Tomchak explained. What type of videos should a journalist share? Tomchak and Barry believe there are two two types of video that journalists should share: breaking news and footage from behind the scenes. Journalists can share videos of breaking news on social media while waiting for the package to be edited or waiting for a live time slot. "With this app you are breaking news in small snippets and can tease what stories you are out on," Barry explained. Another type of video that is already proving popular is the behind-the-scenes footage. "Audiences love seeing how news is made," Barry said, whether that is a journalist trying to cross an international border, meeting a big name interviewee or seeing the cameraman or woman in action. Tomchak added that sharing a short video can create "stickiness" for content. "If you are interviewing a big politician or celebrity the short video can act as a tease," he said. The interview may be being broadcast at a scheduled time but sharing a preview or a behind the scenes taster on the broadcaster's Facebook page ahead of time can create an "extra sense of stickiness". "We all know audiences are going to more than one screen," he said, with the app providing that second screen. Why a maximum of 75 seconds? Other video-sharing apps have different maximum video lengths. Vine allows for videos of just six seconds, whereas Tout allows for 15 seconds. For its video-sharing platform WorldStream, Wall Street Journal reporters use a modified version of Tout, extending the maximum length to 45 seconds (there is more on WorldStream here). Vizibee's maximum time is 75 seconds. Tomchak, who has worked in television for many years, said this was decided on based on the standard rule for a television 'rant'. A 'rant' is the answer to a single question, he explained. Rants are usually around 45 seconds. "People usually file one-minute-five-second or one-minute-10-second rants which can then be cut down. The idea is that 75 seconds gives enough for the rant and topping and tailing." From a viewer's perspective a video of around one minute works, Barry said. "You can get a lot in 75 seconds", she explained, adding that could be a good viewing length for someone waiting for a tube train. In addition to BBC journalists David Tomchak and Samantha Barry, who are working on the app in their spare time, two other co-founders, Artem Kiselev and Neha Manaktala, are working on Vizibee full-time. "As a UK-based company we are really passionate about doing something that's based here", Tomchak said. "And we are keen to create a level playing field for all journalists that is not just about those who work for big broadcasters." Vizibee will feature in the lightning round at news:rewired on 19 April. For more information and tickets for the digital journalism conference click here.